I have two female lops who are just over seven and a half years old. I cleaned them out this morning and noticed some fluff on one of my girl's eyes which I subsequently removed, but in doing so I noticed these 'films' in the bottom corners of both eyes. I've never noticed them before, and I was hoping that someone could advise whether they think they may be cataracts, and if so, what my next course of action should be? They don't seem to be causing her any problems or discomfort, so I thought I'd put a query up on here before rushing off to the vet. 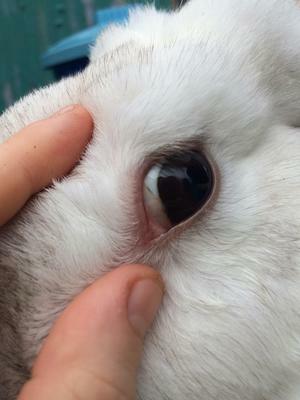 This is going back some time now, but from memory I think that the vet said to me that the film is part of an inner eyelid. 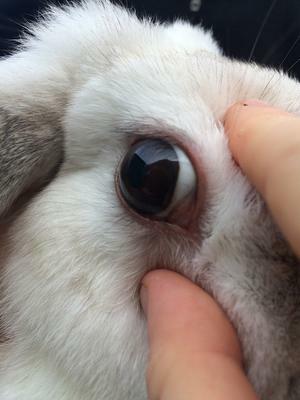 However, it became noticeable because my rabbit had problems with a deformed tooth root which was causing the eye to be pushed out slightly, thus exposing the eyelid. My bunny had to have several big operations to remove the troublesome tooth and the remaining germinal cells, and since then has needed her teeth filing down regularly due to where the opposite tooth on the bottom jaw now has nothing to grind against to be worn down. There’s no saying that your bunny is going through this, though, and hopefully it’s much less serious. My advice would be to visit a vet when you can (make sure it’s an ‘exotics specialist’ vet and not just a standard vet, because rabbits are bizarrely considered an exotic species in the vet world), and make sure you take out insurance before you do. I’ve spent thousands on my bunny since this operation plus with the regular teeth filing, and really regret not having her covered. If pet insurance isn’t your scene, I think most companies offer a ‘cooling off period’, so if it turns out to be nothing like what my rabbit has experienced (who is now ten years and four months old), you should be able to cancel it without being charged for doing so. I hope everything works out in the end for you both, whatever the problem may be. Pls help my vet is away in honeymoon. My baby peanut is 7 months old. I just saw this in her eye and I am worried.